Already, March has started! So before February gets forgotten, I wanted to share my favorites for that month. It's a nice mix of entertainment, technology, beauty, makeup, and food. Enjoy! This post contains affiliate links. This means I'll get a small commission should you decide to purchase from the linked source. Check out my 'About' page to get my full referral link policy! I'm sure you've already heard about the 'Pomodoro' method. It's basically just a timer that's being set for 25 minutes of concentrated work followed by a 5-minute break. While I can't use such methods when painting or drawing (I always skip the breaks haha) I do like to use them when I need to 'power through' an intimidating list of tasks. The app Tide makes the whole timing-myself business feel like relaxation instead of stress! It offers five different background sounds (rain, coffee shop, ambient music and so on) that are perfect for a quick, focused effort. Also, it just looks pretty. I keep coming back to this! You can find the (completely free) TIDE app here. I loved Rogue One, especially the ending! And the soundtrack pieces 'Your Father Would Be Proud' and 'Hope Theme' still make me all emotional. They're also the perfect music to write or draw (tragic) storyboards to. I've been mixing them with Anakin and Padme's Theme and Jedi Steps. I may or may not have an entire playlist just endlessly repeating those tracks. Yes, chocolate. I love my teas strange and varied, but this one might be the crown jewel in my collection of 'sweet' teas. Often, tea with descriptions like 'dessert', 'caramel' or 'cookies' can be very one-note. This one is different: Yes, there's the chocolate flavor, but the tea as a whole is delicious, with so many layers of scents I just never get bored of it. Also, since it's Pu-Ehr, I like to tell myself that this is super healthy. Not only delicious. You can find the Chocolate Pu-Erh as well as many others by the brand Numi Tea on iHerb. Jeju's markets are now flooding with not only mandarins (those had their season in December and January) but all sorts of strange and delicious variations. Currently, the immense (I'm talking melon-sized here) Hagyul 하귤 and the sweet Cheonhyehyang 천혜향 are in season, and we've been making jams and tea out of both. Hagyul especially makes for a great sour-sweet fruit tea. We were able to get organic ones so we could use the peel, too. Traditional Korean fruit teas are pastes - quite similar to jams - that are then dissolved in hot water. As mentioned in my post on life as a freelancer and my plans for 2017, I'm currently easing out of some of my contract work. That means I actually have FREE TIME. And while most of that free time goes into drawing, creating new ideas and products for my Etsy shop, helping out with running the coffee/tea house and, oh, this blog, I did actually get back into doing a bit of exercise. I still have the terrible habit of only exercising around 11 pm or midnight, but hey, better than nothing! I love the channel Yoga with Adriene for flexibility and relaxation (and hey, yoga has push-ups, too!) but also like using weights to hopefully get some of my long-lost muscles back. Once upon a time (...) I did martial arts and was overall active, but coming to Korea kind of threw me off. There are no classes near where I live, and I already get stared at when walking outside, so don't even get me started on jogging! I got the full-sized product of the former and a TON of samples of the latter. Love both, even if they're completely different. The Essence offers quickly absorbed moisture with a refreshing scent (if you don't care for scented products, stay away from this line...), and the Ampoule is a thick, clear goo to help firm your skin. Korean skincare for 'anti-aging' is divided into two fields: wrinkles and 'firmness'/skin texture. Since I don't (yet) have all that many wrinkles, I focus on the latter, and really liked the result of that Seawater Intensive Ampoule! It's rare that I can actually see results in such vague fields as 'plump' or 'firm' skin, but this one actually made a big difference in my cheek area, despite not using it every single day. Keep it up, please! I already own and love their Coconut Lip Balm, so when my next iHerb haul came up, I couldn't resist my deep and true love for coffee. This one actually smells like coffee beans with a hint of cacao, and maybe coconut butter? In any case, delicious. Hurraw! products are organic, vegan and this one contains jojoba oil (my favorite facial oil), coffee bean oil and cacao butter, as well as vitamin E.
One downside: A lot of lip tints really don't like my Hurraw! balms and won't stain on top of these. But they work perfectly fine the other way around! Hurraw! has a lot of different flavors and special lip balms - you can check them out here! This is my daily lip tint. A basic red, not too pigmented and very natural looking. Goes with anything and everything. I'm mostly just mentioning it because mine is nearly empty and these seem to have been discontinued? At least some of the shades have disappeared and I'm already sad. I've got this HUGE sweater that's got a skirt attached to it. It looks as if I'm wearing an overlength shirt underneath, so it's perfect when paired with leggings. Since the sweater is so bulky, I'm able to wear multiple layers for extra warmth... that was essential for that cold spell during February! Also, I'm just very lazy and this was the perfect working-from-home option. A beautiful discovery in February was this flower shop and greenhouse turned cafe! Especially in winter, the warm, slightly humid air and heady scent of flowers gives a welcome change of pace. Located in Songdangri on Jeju Island, South Korea. A planning session in the flower shop cafe 'Songdang Namu' on Jeju Island. Surrounded by bouquets and cats, planning the next week is even more fun than usual! Woljeongri was a very calm region of Jeju Island just a couple of years ago. Now, it's only this empty in the depths of winter. Countless coffee shops, restaurants and stalls crowd along the shore, and the white beach is usually full of people taking walks and pictures. Since I'm vegan, a lot of Korean barbecue places don't have any options for me except a bowl of rice. But going to barbecue restaurants is pretty much a Korean tradition at this point - especially if you're a large group of people! 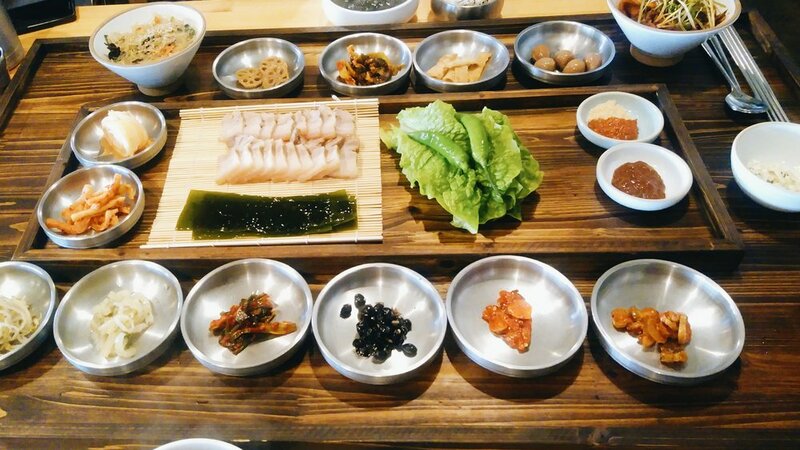 Gobdeulrak offers a really nice selection of Banchan side dishes, and a lot of those are actually vegan! Compared to other meat-specialized restaurants, there's a lot of care put into presentation and ingredients here. If you're in a situation where you 'need' to go to a Korean barbecue, I can recommend this one on Jeju Island! ... so here's an obligatory selfie in the flattering light of the flower shop cafe. The camelia flowers of Korea are smaller and have fewer petals than their better known western variety. Slowly, those are taking root here on Jeju Island, too, but the 'original' Korean camelia flowers can still be found all over the island! I wanted to take home all the flower pots! Since the greenhouse turned cafe was a flower shop, too, they still sell pots and bouquets there. You can find the Songdang Namu Cafe on the outskirts of Songdang-Ri on Jeju Island. It still throws me off that there's palm trees all over the island, even in winter! I listen to a lot of audiobooks and generally love a variety of genres. My favorites range from classics to science fiction to non-fiction. But one genre that had me in a bit of a reading slump over the last months was Young Adult. Maybe it was because of some anticipated releases that left me disappointed, or just an oversaturation of certain themes that run rampant at the moment. BUT. While I didn't love Leigh Bardugo's Grisha Trilogy, this book set in the same universe had everything I wanted: Multiple viewpoints (without re-hashing the same scenes and emotions), a cast of characters that kept me engaged, decisions that actually made sense and a heist plot with twists and turns all the way. Often, I find fantasy/YA books to be very draggy in the middle, after the initial setup has been taken care of, but Six Of Crows kept the tension high from beginning till end, while still leaving the characters room to actually think and be human beings. If you're on the look for a quick, satisfying, (deservedly) angsty and just fun read, take a look at this one! I don't think you actually need to have read the Grisha Trilogy (I never read the third book) - while you won't get any single easter egg or reference, Six Of Crows and its follow-up Crooked Kingdom stand on their own. It's hard to choose a favorite character from the series, but Chrisjen Avasarala is my space mom. Her dialogue in the books is pure gold! I've declared my love for this book series over and over again, but hey, it's just that good! And I believe it's also very relevant to current political events. Or to humanity in general. On that note, I wasn't quite as enamored with the TV show adaption's first season. Or rather, the first half of the first season. The individual storylines felt a bit meandering when compared to the books, but stars did the atmosphere (or lack thereof hurr hurr space joke), the design and actors and the whole second half make up for that. Just keep going until you hit episode four! Now, The Expanse is on its second season on SyFy and I'm biting my nails while waiting for new episodes each week. I've read all the books multiple times, but the show hits that sweet spot of being incredibly true to its source material while adding enough new excitement and scenes to keep me on my toes. GO WATCH.